Sombra Professional Therapy Products are used and sold by thousands of chiropractors, massage therapists, physical therapists, and other health professionals. Our product line includes warm and cool natural pain relieving gels, a rich, multi-purpose massage crÃ¨me, a therapeutic lotion, a gel oil, ultrasound gel and ultrasound therapeutic lotion, and an instant antibacterial hand sanitizerâ€”all made with natural ingredients to the highest quality standards. 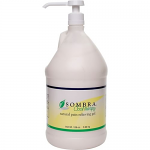 Sombra Therapeutic Massage Lotion provides gentle penetrating heat to tight, strained muscles. Capsaicin and Menthol give a warming effect to aid in deep tissue release techniques. Sombra Cool Therapy, 1 gal. This gel provides controlled cooling without freezing or irritation and has exceptional glide for point therapy. Sombra Cool Therapy, 1/2 oz. cool therapy gel is good for acute conditions or injuries that have just occurred, whereas the original warm therapy gel is good for chronic conditions and basic aches and pains. Sombra Cool Therapy, 2 oz. Sombra Cool Therapy, 32 oz. Sombra Cool Therapy, 4 oz. Sombra Cool Therapy, 8 oz. This gel provides controlled cooling without freezing or irritation and has exceptional glide for point therapy. The cool therapy gel is good for acute conditions or injuries that have just occurred, whereas the original warm therapy gel is good for chronic conditions and basic aches and pains. Sombra Warm Therapy, 1 gal. Sombra Warm Therapy, 1/2 oz. Sombra Warm Therapy, 2 oz. Sombra Warm Therapy, 32 oz. Sombra Warm Therapy, 4 oz. Sombra Warm Therapy, 8 oz.